This week we've been updating our Facebook photo galleries with photos from recent customer purchases and can I just say wow?! Seriously, wow. 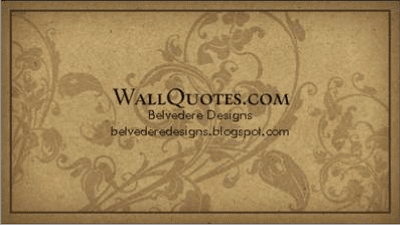 We love to see our wall quotes "in real life" and are always so excited to see customer photos. And so, to help inspire that little extra effort, we've decided to sponsor a giveaway. 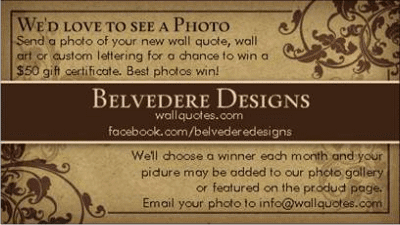 Just send a photo of your new wall quotes, wall art or custom lettering to info (at) wallquotes (dot) com. We'll choose the best photos each month and award the winner a $50 gift certificate (wa-hoooo, right?). Info will be included in each order - watch for it, get out your cameras and presto - you just might be $50 closer to that fancy wall quote you've been drooling over (or maybe you're a generous soul and already thinking Christmas?). P.S. Aren't these business card designs divine? We love Vistaprint; you just might too.